Another one of the best lines of the last 5 years seems to be wrapping up - The Muppets. I say 'seems' because the end isn't really here, but the line is transitioning. Bricks and mortar support is pretty much dried up, but support through the Palisades Direct store, Collector's Club, on-line retailers and conventions is still solid. In 2005, we could see as many as a dozen new characters hit the market, but through non-traditional routes. But even with this change, November is going to be a massive Muppet month. We've had the final two mini-muppets in wave 3 show up at the Palisades store, next Monday (the 15th) Ebay will be selling the Santa Chef holiday figure, Sweetums will start shipping from OMGCNFO.com this week, the special Jim Henson figure should be available from Palisades, and series 9 will be available from many on-line retailers. 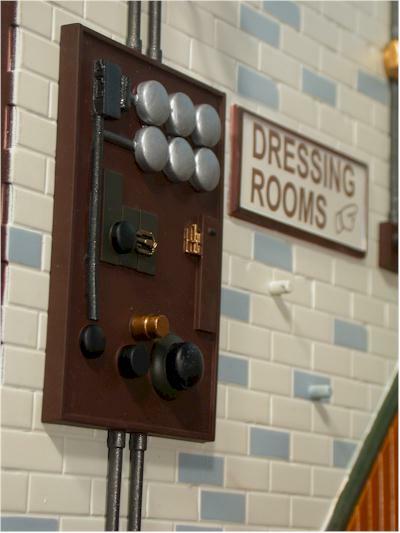 Added to all that muppety goodness is the newest, and likely last, play set in the line - the Back Stage. My set arrived last week from EBgames.com, but I have some other on-line options at the end as well, and I have to admit that if I were to support someone selling the figures at this point, it would be a retailer that was going to continue supporting the line in 2005. This set isn't cheap by any means, running around $50. 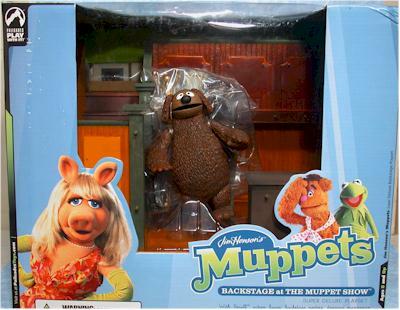 But it does have some things that make that price more attractive, and it includes the infamous naked Rowlf, a figure fans have been looking forward to for quite some time. This is one big blue box! It's much larger than any of the previous play set boxes, and has some huge graphics on it as well. The actual Muppets are on all sides, but oddly enough, there's no shot of the Rowlf muppet. There's some decent descriptive text as usual, and the huge window gives you a good view of the first floor of the set, along with the included figure. The number of twisty ties was also reasonable, which is always a big plus. I'm surprised that the Twistoni's, the Mafia family that controls the twisty tie market in south east Asia, allowed them to skimp like this. Erica and Greg might want to have Travis start their cars for them. This play set is truly a remarkable piece of engineering. It has not one, not two, but THREE actual levels, and with two sets of stairs, it required a rather unique design. 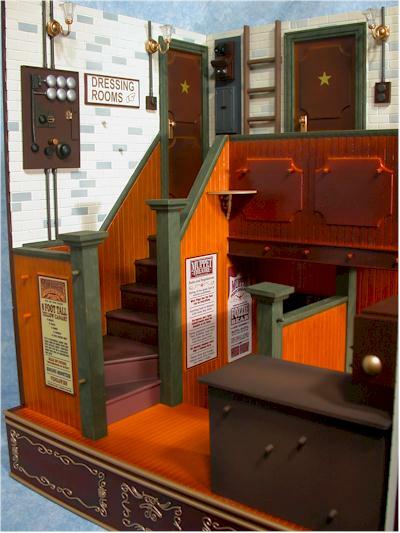 The set comes without the upper walls attached. Have no fear, because Palisades has included instructions on-line, but you probably don't need them. The assembly is fairly straight forward, and includes popping on the two walls, adding one post, and applying appropriate stickers. Note - most of the photos do not have the post at the top of the stairs. I could tell you that it's because I didn't want the post blocking your view of the figures on the set and the back wall. I could tell you that, but I'd be lying. I forgot to put it on before shooting the photos, and I was too damn lazy to shoot another whole set with it included. I do have a photo with it though, just to be complete. I've heard some complaints that getting the set together was a bit tricky, but I didn't have any trouble. You do want to be extremely careful with the three light fixtures that attach to the top walls. It is very easy to snap them off, so only apply pressure to the base as you push them in. Once you have everything popped together, and three of the stickers applied (there are sculpted areas for three of the included stickers, but you could find ways to use the others with some creativity), you'll begin to appreciate just how bowzers this set is. Did I mention that it's huge? Because it is! 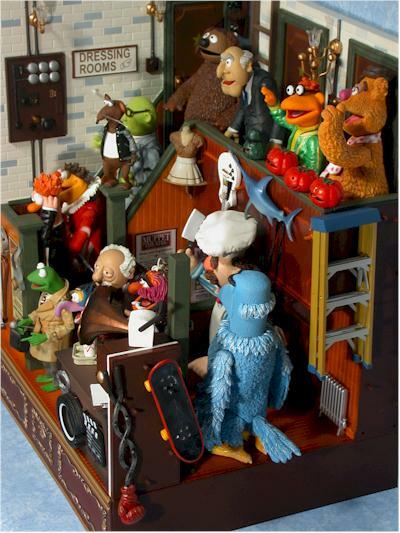 I put 14 Muppet figures on it no problem, including some of the space challenged like Chef and Sam the Eagle. The detailing is just about right too - not too realistic, since this is supposed to be a Muppet set, but not so basic as to appear completely cartoony. Brick and wood patterns adorn the walls and floor, and all the smaller sculpted areas - the radiator, bank of stage light switches, power panel, etc. - look absolutely amazing. While the set is huge, scale isn't perfect. I'm not surprised though, since the set would have to be monstrous to be in actual real scale. It's not bad though, and the figures look great within the overall context. Rowlf is the signature version, buck nekkid for all the world to see. Of course, since he's a dog, that's no surprise. This sculpt isn't my favorite, although he's certainly not the worst of the entire series. 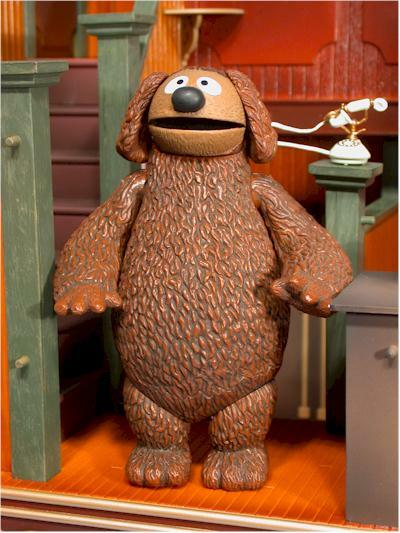 He is very much like the early sculpts though, and the smaller head and pear shaped body doesn't match up with my own personal idea of Rowlf quite as well. The fur sculpting isn't quite as finely detailed as you might expect, and I actually prefer the Tux version. It is nice to have this version though to round out the collection, and he makes good sense as a pack in figure rather than a stand alone. 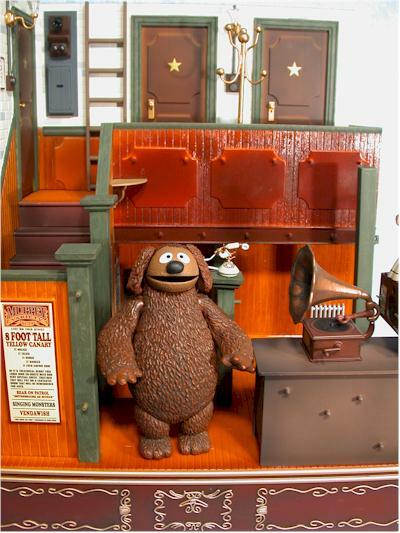 The paint ops on both the set and on Rowlf were spot on, dead to rights, perfect. I don't have any issues with slop, bleed, or poor consistency. There's a nice use of brush strokes and thin paint on the sections of the set that are wood, but don't have textures. This makes the paint appear more 'wood-like' without the benefit of additional sculpted details. 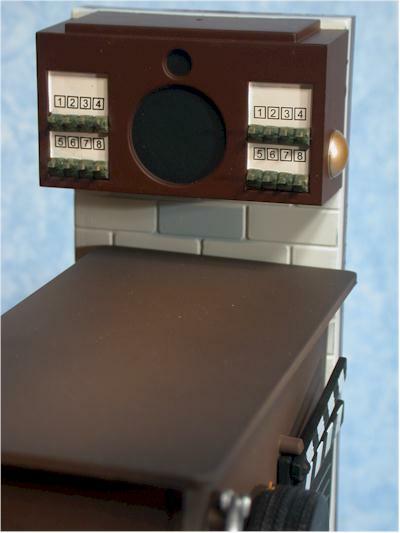 The brick colors are bright and vibrant, and the included stickers look terrific. There are four large and four small, with spaces sculpted on the set to apply two large and one small. The stickers are very sturdy, with great text and graphics. Be careful applying them though, particularly the smallest one leading down the stairs to the exit, where it's tough to reach. I find the best way is to peel down about a quarter of the backing, line up the top and edges of the sticker and attach them, then peel the rest of the backing off as you press the rest of the sticker in place. 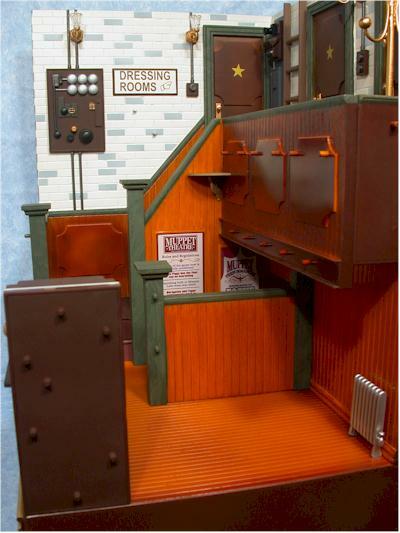 The set itself doesn't have any articulation, so no doors open, and the desk drawers are sculpted shut. 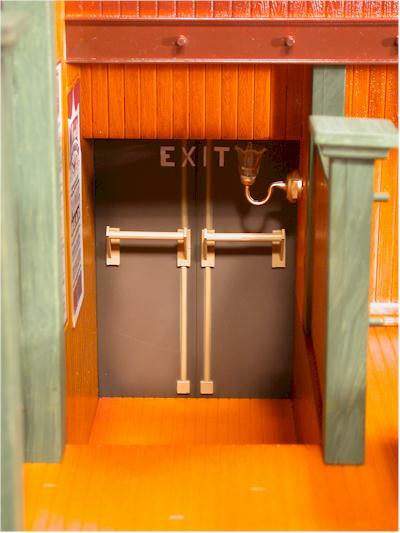 It would have been tough to engineer the dressing room doors to open, since there's not enough room for them to open out, and to open in would have made the set less structurally sound. But had the exit doors downstairs opened up, that would have been a really nice touch. 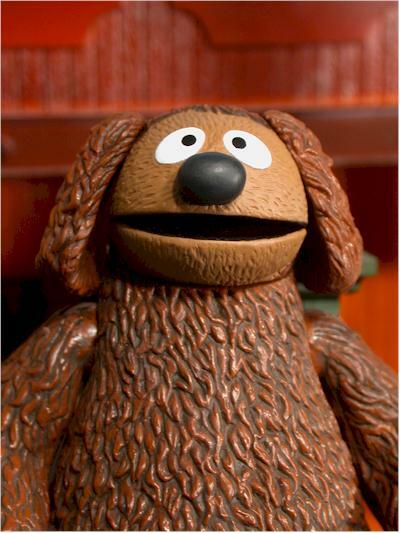 Rowlf is articulated of course, just not a lot. He has neck, shoulders and hips, and is one of the less articulated figures in the series. 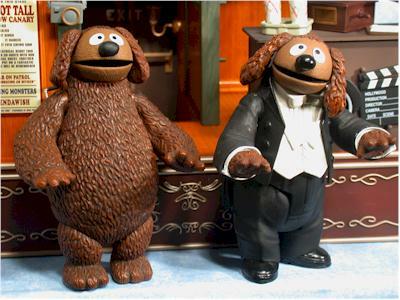 Think in terms of the Fozzie Bear articulation, and you'll have an idea of what Rowlf is like. Some additional arm articulation would have been nice, or perhaps a ball jointed neck, but what we have is certainly adequate. Palisades may have spoiled us beyond all hope with the Kitchen play set. If you're looking for 40 gazillion accessories, you won't find them with the Back Stage. However, what is here is pretty damn good. There's the old Victrola, with articulated arm that can raise and lower on the album, dress dummy, large coat rack, and Princess phone. The accessories are all good sculpts, and the paint ops the usual outstanding quality. My only quibble here is with the phone, and it's all due to the plastic cord. Personally, they could have skipped the cord and I would have been fine, or gone with something similar to the news desk phone. But the harder plastic they used here means that you have a tough time getting the phone to remain on the cradle, and even once you do, the cord is too obvious and distracting. Other than that though, the accessories are all well done, fit in nicely, and are useful decorations. This set is also designed with about a million pegs to hang various past accessories on. You'll notice in my photos that I have a ton of old stuff hanging around, and you can find even more choices, particularly in the Kitchen set. Some things hang better than others, and some of the pegs work better than others, but overall it's a really nice touch. 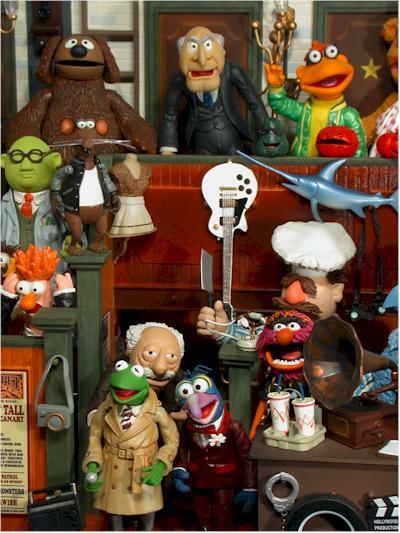 If your kids enjoy playing with the Muppets action figures, this set will work great. They'll have to take some care with the light fixtures, but that's really the only spot likely to break. Once you have everything popped together properly, the walls stay put, so you don't have to worry about putting it together again every time you pick it up. 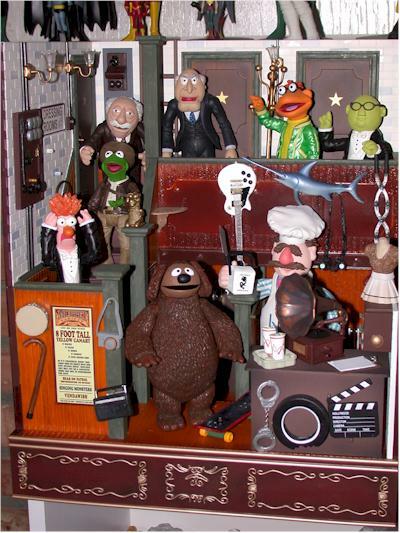 There's plenty of room for a variety of Muppets, so it works well both as a display set and as a true 'play' set. This set cost me fifty bucks, which is far from cheap. But you need to compare that with some other similar values on the market recently and currently. Most of the Simpsons exclusive Toys R Us sets were $40, and while the talked, they were also about a quarter the size of this set. The Batman Forever bat cave of a several years ago is larger, but was close to $100 I believe initially. While this set would have had to be around $35 - $40 to come out as a great value, at $50 it's still in the average value ball park. I'm betting that the production numbers on this are low enough to place it in the exclusive category, and considering the size and complexity, I'm not surprised about the price. This looks like it may very well be the final play set in the Muppets series, and if that turns out to be true, then it was a fitting set to exit on. It's a critical set of the original show, some place that every fan can instantly relate to. It gives you the opportunity to display a nice big chunk of the figures in one spot, along with a ton of the various accessories that have been released. The price and the less than stellar Rowlf hold it back from the coveted four stars, but it will be one of the nicest play sets released this year, and if you've been a collector of the line, it's not one you want to pass up. You might be tempted to wait for clearance prices, but I wouldn't recommend it. I don't think the production numbers are high enough, or enough retailers with these on the shelves, that we'll see it make it much lower before it's gone. - Clark Toys has the set for $50. They also have some good pricing on series 9 and older series of Muppets figures. KEEP SCROLLING DOWN FOR A SHOT WITH THE ADDITIONAL POST!